And so shall the Legend of Moonshadow continue to grow. Well, that was unexpected! They’re finally working together, even if only one of them knows it. Potentially awkward, yes, but maybe a superhero team-up will improve their relationship. A. It could help Tyler and Toby get closer. B. It could cause Toby to hate Moonshadow. C. It could wear away at the goodwill Tyler had for Toby. I’m not sure any of those are mutually exclusive although the A and C result won’t happen at the same time. A. Because it gives Toby an opportunity to open up without baggage, and it might motivate Tyler to listen to Tobies problems as something more than this is why Toby is dangerous. Also Tyler can give Toby advice he might not be able to give as himself. B. and C. Because Tyler wants to make sure this does not end in disaster and Toby is hoping to magically fix his family. I could easily see a betrayal or something that feels like a betrayal happening when those goals come into conflict. I’m sure he wants his brother to bring the sphere to the swap shop when the villain takes him there. The exact item wasn’t specified but he said in a few pages back. I’m sure the shop wants the sphere thus the trade with Dynamode to bring Tyler to trade with. The interesting question is what do they intend giving Tyler in exchange for the chaos sphere? Given the concept of keeping things on their destined track feel, it’s something very plot or character relevant. I need to archive binge. The city that they had a sale on might be mentioned post alien invasion (or somewhere else). I’d like to know the reason for that. Quantum Powers does have some insight into cause and effect, destiny and similar aspects. If Toby is not good at Radio Speech yet, It would probably be best to assume that anyone and anything that can pick up a radio broadcast could be listening in to the conversation with Tyler. I doubt that the Revenant has shared the details of his encrypted communications with Toby. Yeah, that was my second thought. On the other hand, when the Powers find out, they aren’t going to seriously punish their little ‘prodigy’ Quantum Powers. My first thought was: why not, they had it before, what’s the harm in returning it to them? They have some harebrained idea of what to do with it (like give to the other twin)? Or even more likely, separation already drives him nuts. Doesn’t necessarily follow. It could be that Tyler’s earpiece is set to listen on a fairly broad band – or even if it’s just the one frequency and Toby’s tapped into that, just because HIS messages are (probably) in the clear, doesn’t mean the Revenant’s were. Given that the helmet was smart enough to recognize documents and text messages to take pictures of automatically, switching between encrypted and clear transmission based on who he’s talking to wouldn’t be out of the question for it to do automatically. It’s the sort of thing Tyler could certainly run afoul of if he’s not aware of it, but it’s in keeping with what his issued gear has already been shown to be capable of. So do you think decrypting communications would be easier for a lawful magic user, or a chaos magic user? QP would easily be able to switch the helmet to a non-encrypted channel, it’s simple technopathy and part of the quantum manipulation / order power set (as long as the helmet does have the capability, off cause; otherwise you need he chaos power). As soon as Tyler fell through, he was already throwing his grappling hook. 😀 His moves as Moon Shadow are becoming more and more natural, more second nature. his brother can change his uniform appearances at will. I want to see what he does being Moonshadow as a distraction later. For the sake of paperwork being done. If Tyler didn’t have excellent reflexes he’d have been killed in gym class alone a long time ago, and he’s dealt with weird and unexpected events his entire life. Add in his training with the Revenant and he’s probably at least pushing the border of Charles Atlas Superpowers by now, at least with his reflexes. Wait, Toby doesn’t know that Tyler is Nightshadow? I thought he had Tyler’s memories from before he was cloned, or was that something he lost when the walkie talkie was ejected from his skull? Toby is established to not remember. To be fair its possible he could remember R but not the outfit or nickname. Are they now a triplet Tyler ,his clone and the chaotic parts of the clones personality they extract and sealed in a orb? I just thought of this, has anyone else wondered if Toby (or maybe a time travellng Toby from the future) could be Power and Glory’s boss? Toby’s powers could do s lot of what we’ve seen the organization do (put targeted ads in fortune cookies, etc) but their inventory means we’re either dealing with time travel/time compression or Toby has been raiding several collections. Interesting idea. I’ve always wondered what happened to the artifacts that Revenant captured. Recycle the collection, adds to job security! Sorry. Above reply was for Faust. Rev gave a confiscated shrink ray to Cecil. I’m sure the Rev uses a lot of captured stuff. Batman and all Batman expys do since it’s the pragmatic thing to do. So does Superman. As for the job security thing, Revenant’s not the kind to do that just so he can keep on being a vigilante detective (but then you’re joking anyway). When was there an ad in a fortune cookie? We missed the panel of the cross fire missing Moonshadow resulting in Zodon and Dynamode being collateral damage! Tyler is growing up. His body is turning towards the awkwardness of teenager..
It’s wouldn’t be suspicious for Moon Shadow to know Kid Powers is the kid of Ultima Powers and Sovereign. 1. Toby’s debut was witnessed by a lot of the superhero community and was introduced by his parents, so his parentage is public knowledge by now. 2. This is Moon Shadow we’re talking about. How can he- one of the most competent and mysterious of kid superheroes- not know that Kid Powers is the child of Ultima and Sovereign? I think when this page was first posted Toby might have said “mom and dad” instead of “my mom and dad”. I could also just not remember it right. Either way what Tyler has to do is not call them mom and dad himself if he wants to avoid suspicion. Specifying that they are Toby’s parents and not his own would actually be more suspicious. Given the filter that most of the world seems to have where Moon Shadow is concerned, any minor slips on Tyler’s part would probably be overlooked/rationalized away. If Tyler is smart, he wouldn’t say anything to Toby. Unlike Cecil, Moon Shadow doesn’t use a voice modulator. Dynamode isn’t familiar enough with Tyler to be able to tell by that he is Moon Shadow by voice. Toby definitely should be able to, since Tyler’s (and Moon Shadow’s) voice should be identical to his own voice. Unless Toby listens to a recording of himself often there is no reason to believe he would recognize Tyler’s voice because its like his own. In my experience that recorded voice sounds nothing like I thought my voice sounded like. ^ This is true. Until you hear a recording of your own voice, what you think you sound like is quite different from what you actually sound like. It’s established that wearing a mask, helmet or glasses will change the voice and speaking habits to make it unrecognizable. And now it looks like this page was edited. Instead of saying “Mom and Dad”, it’s “_my_ Mom and Dad”, so I guess it’s clarification that Toby doesn’t really know who Moon Shadow is. 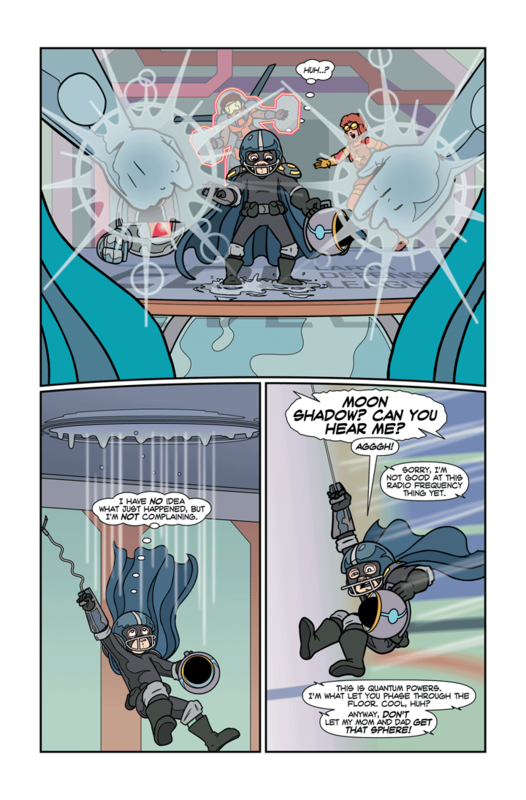 The thought strikes me that this incident isn’t going to hurt Moonshadow’s reputation for having vaguely defined but awesome superpowers. He has exhibited a range of powers that’s very interesting. He is “misbehaving” so unless all this gets explained it could definitely greatly improve or greatly hurt his reputation. 7) He has an awesome jet.